Banana trees (Musa spp.) are one of the top tropical foliage plants for the summer patio garden. In frost-free climates they can be grown year round in the ground, and will even produce tasty fruit, but in the rest of the country they are easy to grow in a pot and bring indoors for the winter. 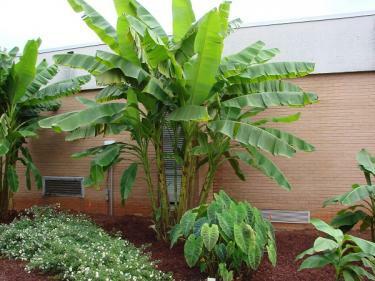 Bananas are plants with an enormous stature, ensuring a bold statement wherever they are used in the landscape. Bananas range from five to 15 feet in height depending on the variety and have enormous leaves -- up to five feet long and a foot wide on the largest specimens. Bananas are considered herbaceous perennials and their stems are soft and pithy, rather than hard and woody, but they grow to the proportions of a small tree. 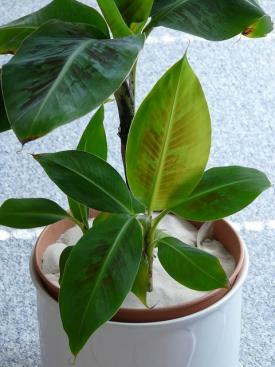 The leaves sprout only from the top of the plant and are constantly shed and replaced throughout the growing season. 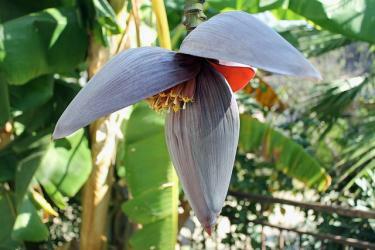 In climates with a long season of hot days and warm nights, banana flowers will emerge from the top of the tree on a long, downward arching stalk with a head-sized cluster of petals at the tip. Another few months of warm weather is required for the fruit to mature, making it possible to harvest ripe bananas only in southern California, southern Florida, and Hawaii. Bananas naturally form clumps with multiple trunks growing in close proximity, allowing them to be used as a grove in large scale landscapes. They are especially attractive in poolside settings surrounded by smaller tropical foliage plants and brightly-colored flowering specimens. In pots, they can be used in the landscape in the same ways as if they were planted in the ground, except they will ave just one of a few trunks, rather than spreading out into groves. The pots can be placed on patios, decks, balconies or out in the landscape. The pots can even be buried during the warmer months of the year to mimic the appearance of a planting in the ground. Plant bananas outdoors after all danger of frost has passed. They need full sun and rich soil. They thrive on moisture and are tolerant of poorly drained sites. 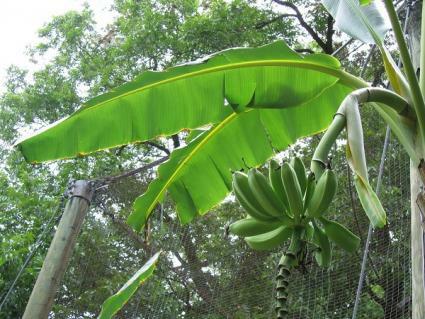 A protected location is preferred, as bananas leaves are easily shredded by the wind, reducing their aesthetic appearance. Soilless potting mix is suitable for potted specimens. A good rule of thumb for container size is to use a pot that holds as many gallons of soil as the number of feet to which the plant is expected to grow in height - i.e. a dwarf five-foot banana would require a five-gallon pot. Pots with a wide, shallow profile are preferred. If the plants are going directly in the ground, enrich the soil heavily with compost at planting time. 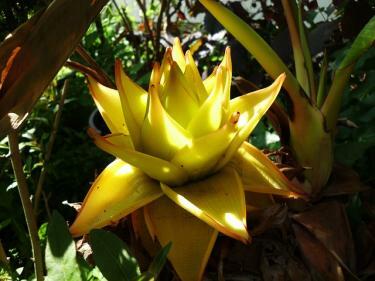 They are widely available in garden centers in the summer as tropical accent plants, even in cold climates. They are always grown from transplant, not seed. Bananas need constant irrigation -- do not allow the soil to dry out. They also thrive on fertilizer - products that have a high nitrogen and high potassium content are ideal. Feed with liquid fertilizer at least once a month for best results. The only other maintenance needed with bananas is to remove the leaves as they fade - simply cut the leaf stalks as close as possible to the trunk. For plantings in the ground, the entire tree will die after fruiting and must be cut to the ground. However, new trunks will continually grow from the clump to replace those that have fruited. When nighttime temperatures cool off in fall, bring potted bananas indoors for the winter, if desired. They have high sun requirements, so they tend to suffer indoors unless there is a greenhouse, solarium or, at the very least, a bright south-facing window where they can overwinter. Do not fertilize over the winter and allow the soil to dry out a bit between waterings. Banana plants are generally free of pests and disease. Outside of tropical areas, gardeners generally grow bananas that have been developed as ornamentals, rather than fruiting plants. Some of these can tolerate brief periods of freezing weather. The hardiness zones below refer to the hardiness of the roots, however -- the trunks and leaves are less cold hardy. Setting up a few potted banana plants is one quick and easy way to make a bold statement in the landscape. They are the kings of the tropical container garden and create a balmy ambiance wherever they are used.